The Jewish Quarter. The Ghetto. The Jewish Section. The Lower East Side around the turn of the 20th century had several nicknames—with The Ghetto sounding particularly strange to contemporary ears. 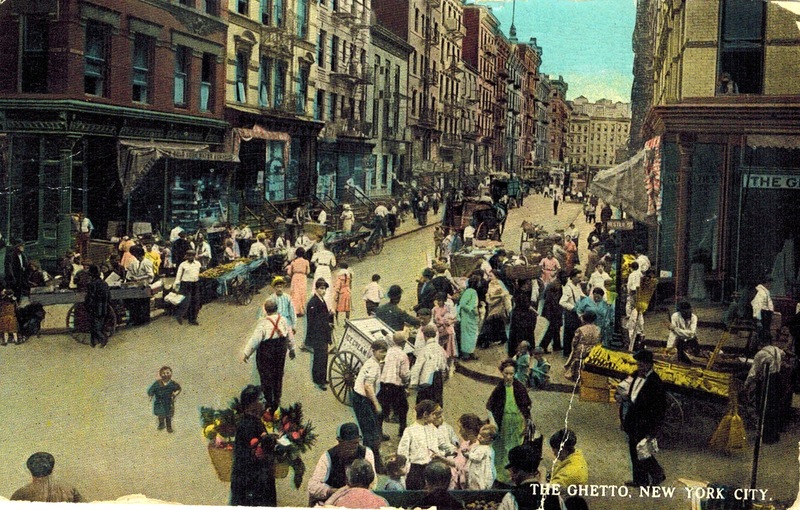 But I’d never seen the neighborhood referred to as “Judea,” as it is on the back of this vintage postcard image of pushcarts, tenements, and crowds on Hester Street. It was sent in by an Ephemeral reader who had also never heard of a New York neighborhood referenced as “Judea,” the ancient name of the province where present-day Israel is located. This entry was posted on June 20, 2013 at 5:49 am and is filed under Fashion and shopping, Lower East Side. You can follow any responses to this entry through the RSS 2.0 feed. You can leave a response, or trackback from your own site. Overtime neighborhood designations change more or less in line with the demographics. I like Judea as it has a biblical/historical ring to it. Currently the Hispanic residents refer to it as Loisada (Low-ee-sah-dah), Spanglish for Lower Eastside. I like the biblical ring too. I haven’t seen that, throughout my research on “Lost Synagogues” of Manhattan (especially the LES and East Village).